Many urbanists here in Helsinki have recently needed to double-check whether they’re dreaming or really wide awake. This is because last month Helsinki’s City Planning Department published new documentation on what the city will look like in 2050 and what are the basic pillars of the new city plan. 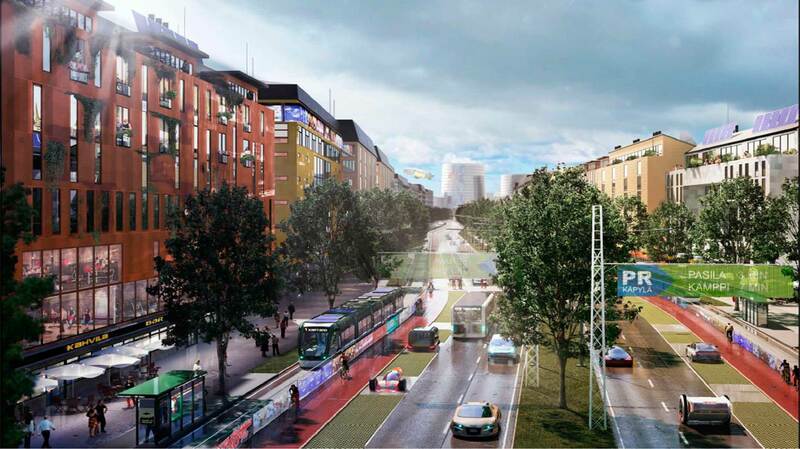 Amazingly, the grand visions that have been in the air in recent years are again one notch closer to becoming reality: “In the Helsinki of 2050, densely constructed suburban centres will be connected by rail traffic. The downtown area will have expanded along the motorways, which have been converted into city boulevards. […] The Helsinki of the vision is more densely populated in all areas than that of today. New construction is mainly located around the suburban railway stations. The suburbs have become centres of urban living, services and workplaces (source)”. These ideas constitute a significant step away from the business-as-usual and modernism-embracing tradition of Finnish planning. Just a few years back, no one would even have dared to suggest trading a freeway for apartments. And it’s not only good news echoing from the halls of the City Planning Department. Also decision-makers have finally caught up with the idea that there are many of us who actually do like to live in urban areas. The real estate prices in the inner city of Helsinki have been skyrocketing for years, a clear signal that the supply and demand don’t match. It was also reported recently that an increasing number of families opt to stay in the inner city over moving into the suburbs as children come into the picture. Clearly things are looking better than ever for Helsinki. From the planning point of view, one key development behind this burgeoning urban renaissance is a generation change in the city planning department and the city council. For instance, there are at the moment people working on the new city plan whom I just a few years ago used to study with. However, I want to draw attention to one important sector in the city-making business that does not seem to share the new-found urban passion: the building & construction industry (BCI) [generally referring to those enterprises involved in the physical materialization of the city’s plans]. Since the introduction of the modernist apartment building and increasingly today, many critics rightfully argue that the BCI only offers highly standardized and monotonous solutions to the housing market. In other words, everything that comes out is more or less the same product with just a slightly different wrapping. As regards to residential development, there have been little signs that the suburban values of the BCI would have gone anywhere. I’ll highlight this by an example of an inner-city urban renewal project close to where I live: the Konepaja area in Vallila. This site is an old railway workshop zone where the national railway company used to put together train cars. It became obsolete in 2001 and is now in the process of redevelopment with an aim of transforming the area into an urban inner-city neighborhood that also houses a creative industry scene. The first phase of construction began in 2006 and the entire YIT-managed project area is supposed to be finished by 2020 with ca. 1300 new apartments and office space for 2500 workplaces. YIT claims that “when the old and new meet, something unique comes out”. In this case it is supposedly an exciting and diverse extension to Helsinki’s inner city that will be full of buzz and directly comparable to landmark regeneration projects around the world such as TriBeCa in New York and the Docklands in London. Sounds too good to be true, right? Unfortunately, this is what the case very much seems to be. Even before you visit the area, you may spot traces that they don’t exactly share the urbanist values they like to talk about. 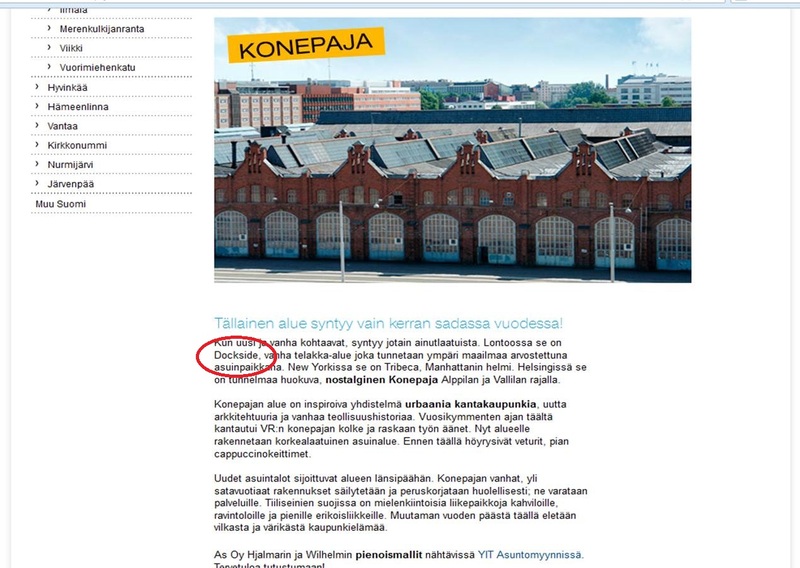 In this case they for example refer to the London “dockside” instead of “docklands” in the Konepaja project description and materials. Now this may seem like a petty crime, but I argue after having attended a seminar this past summer where one of their executives talked about “neighborhood branding” and the Konepaja project that the mistake underscores the lack of commitment to any urban values. Firstly, the Docklands is one of the school book examples of the urban landscape effects of the shift towards a post-industrial economy and of the emergence of a culture-led approach to urban planning: derelict industrial spaces are transformed into areas that nurture cultural and creative industries. If you’re in the urban development business, such mistakes don’t just accidentally happen. If you were seriously engaged into designing your own interpretation of the “creative city”, you would know better. Secondly, in this process many scholars, like Charles Landry and Richard Florida, have argued that soft factors such as the “look and feel” of a building, neighborhood, region or city have become increasingly important to attract residents, workers and investments. Authenticity, or uniqueness if you will, along with an increased interest in urban living have become key selling points for urban development. Much like selling coffee hasn’t for a long time been about just selling coffee but the experience of getting a coffee. Constructing standardized, one-size fits all, and monotonous living environments are not the future. And especially not their marriage with suburban values which has led to the sprawling low-quality landscapes that are scattered around the centers of Finnish cities. You probably already guessed what YIT is doing in Konepaja. What has been completed so far is a stretch of repetitive apartment buildings that have stronger links to the modernist-suburban-neighborhood-unit style of city-making than a 21st-century urban hotspot. The mono-use blocks are almost identical to the last detail and have been closed off from the street by walls and gates. Furthermore, the next phases of development are planned to consist for example of Le Corbusier-inspired towers in the park. I personally find it difficult to imagine that the Konepaja area will ultimately be anything but another rather generic and sleepy residential zone. I certainly hope I’m wrong. But until proven otherwise, the Konepaja project is a good example of the fact that the BCI like to talk the talk but don’t care too much about walking the walk when it comes to designing building blocks for an urban neighborhood. I think you are exaggerating. When walking Aleksis Kiven katu, it could be much better, but still the story isn’t so simple. Some examples are not justified. E.g. how are Kuokkala and Tampella monotonous and suburban, as you seem to hint? And Finnish tradition of modernism is not so one-sided thing, after all. Everything has also good sides. You could mention new tram line 9; repetitive but still quite attractive architecture; preservation of historic factory buildings in the area and good (red) connection to them; good density; and aren’t the yards still quite nice? And, you can’t yet say anything about Teollisuuskatu street atmosphere. But still, the landscape there is not “low quality sub-urbanism”. Finnish pessimism in its purest form. 🙂 For some reason, you seem to be overtly purposeful how everything is so bad to make your point clear. But that’s not the whole truth. Thanks for your comment. Monotonous as in one or two builders repeating one single (sometimes but not always site-specific) building design within the areas that is grounded on the spirit of the modernist apartment tower. Suburban as in embracing the values (separation of uses, rejection of the street) of modernist planning. Here’s my follow-up on this topic: https://urbanfinland.com/2014/04/12/monotony-exposed-finnish-cities-plagued-with-overly-standardized-and-worn-building-designs/. And finally, things are indeed not black and white but always more of one than the other, depending on from where you’re looking at.